The speed turn is a technique for defensive backs to flip their hips without losing speed while covering a receiver. When a defender has their hips facing one way and the receiver breaks the other way, the defender turns their back to the play to follow their receiver. This technique allows for continuing momentum and movement through man coverage when a receiver attempts to beat a defender at the break point. A good speed turn relies on fluidity and speed in the defender’s hips, as well as quick mental processing ability to turn their back to the ball and then locate it again. Below are two examples of speed turns from the 2015 season; one example where the defender remains in tight coverage; the other where the defender loses the receiver and allows a reception. The first example comes from the Week 6 game between the Pittsburgh Steelers and Arizona Cardinals with 7:36 remaining in the second quarter and the Steelers facing 2nd & 16. At the bottom of the screen, Pittsburgh wide receiver Martavis Bryant (#10) runs a corner route with a dino stem against Arizona cornerback Jerraud Powers (#25). 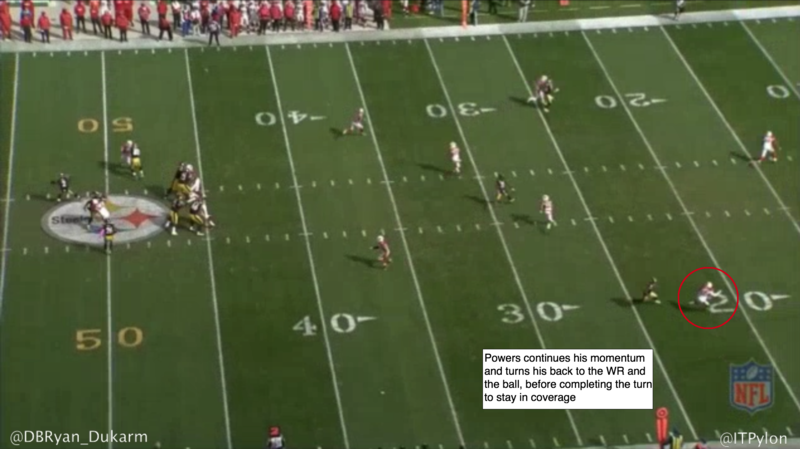 Powers is in off-man coverage, as the Cardinals run Cover 1 on the play. 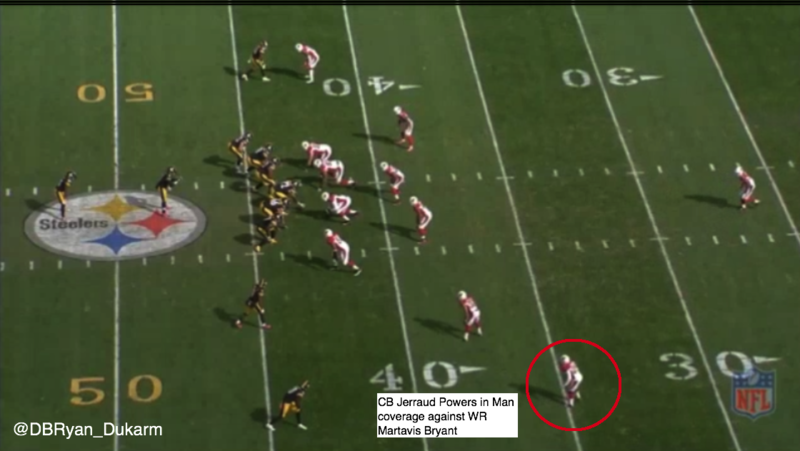 Powers begins the play 10 yards off the line of scrimmage and backpedals at the snap with his eyes on Bryant. Eight yards into Bryant’s route, Powers begins to flip his hips to the outside to turn and run with Bryant on a vertical route. However, when Bryant begins to break inside on a dino stem to set up his corner route, Powers mirrors to the inside, facing Bryant and ready to follow him to the middle of the field. Bryant then breaks off the inside portion of his route and runs outside on the corner, forcing Powers to flip his hips back to the outside with a speed turn. Powers executes a perfect speed turn, staying tight to his frame and not giving up ground in coverage while turning his back to the quarterback and receiver. He is able to stay in coverage on Bryant through the route and deny any opportunity for a pass. With 53 seconds remaining in the second quarter, Brown is aligned at the bottom of the screen, split to the right of the formation, while the Steelers have trips to the left. 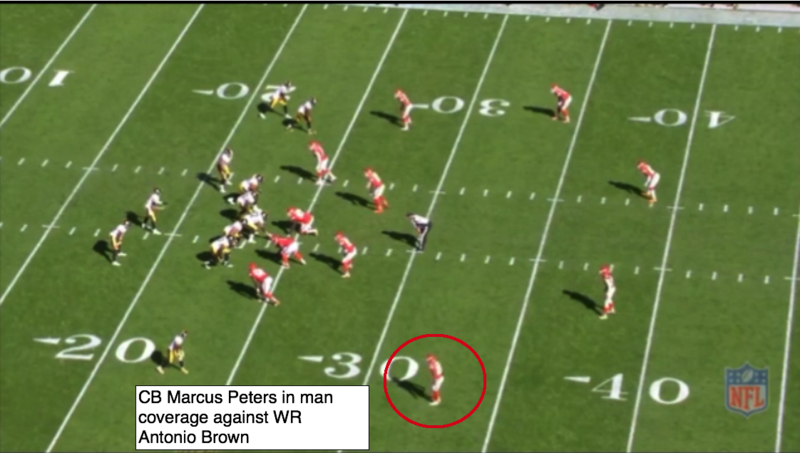 The Chiefs run Cover 4 on the play, but Brown is the only receiver in Peters’s area, so Peters is essentially in man coverage. Brown takes an inside release before running a 20-yard out route. 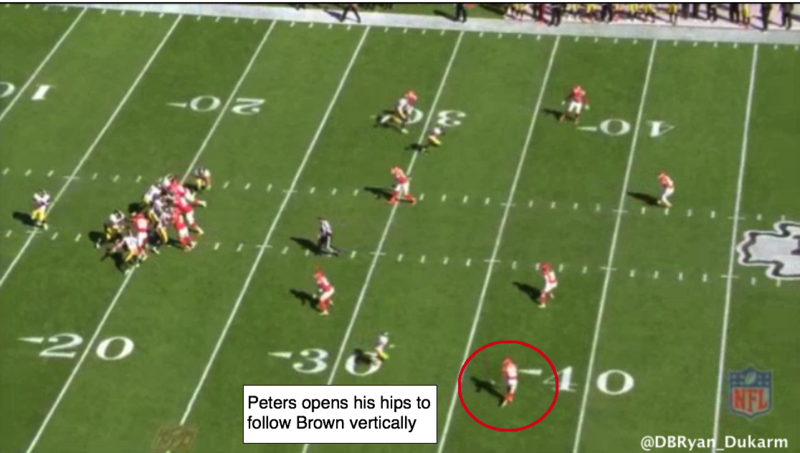 Once Peters opens his hips, Brown breaks the route off and cuts to the sideline. Peters is forced to execute a speed turn, but does so stiffly and slowly, allowing Brown to make the reception before Peters can force him out of bounds. The speed turn is a common defensive back technique that allows for better coverage and fluidity when defenders are forced to turn their hips in different directions. A well executed speed turn happens quickly and smoothly, minimizing the time the defender has his back to the ball and maximizing the time he faces the receiver in coverage. 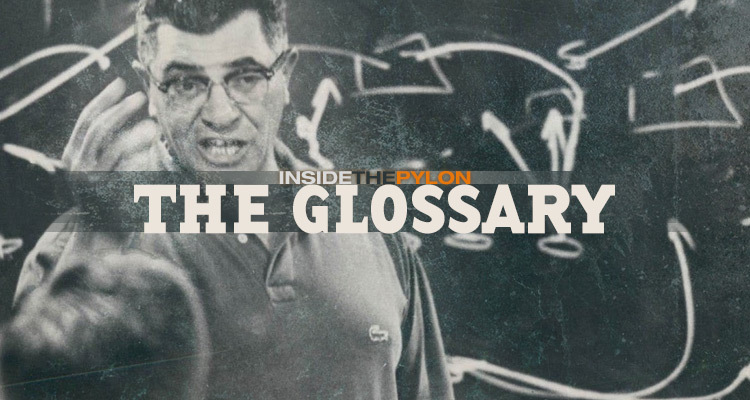 Ryan Dukarm (@DBRyan_Dukarm) wrote this entry.